Fourth Row Center: Film Writings by Jason Bailey: On TV: "My Trip to Al-Qaeda"
On TV: "My Trip to Al-Qaeda"
I’m not sure when Alex Gibney sleeps. The prolific documentarian (whose previous films include Enron: The Smartest Guys in the Room and the Oscar-winning Taxi to the Dark Side) had not one, not two, but three films in this year’s Tribeca Film Festival (now, one of them is an omnibus, but that total doesn’t include his May theatrical release, the excellent Casino Jack and the United States of Money). 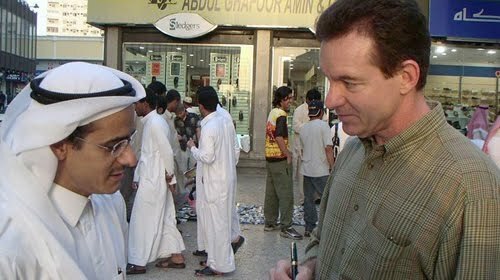 My Trip to Al-Qaeda is his collaboration with author Lawrence Wright, who penned not only the essential volume The Looming Tower: Al Qaeda and the Road to 9/11, but co-wrote the screenplay to the eerily prescient 1998 film The Siege. The film is loosely centered on Wright’s recent off-Broadway one-man show, which he did to purge himself of the more personal elements of writing the book, and in the interest of “opening up a dialogue” about terrorism in our world. It begins in the lead-up to 9/11, which he calls “an event I spent the last eight years of my life trying to understand.” He doesn’t just go back the 1998 African embassy attacks, or the bombing at a Cape Town Planet Hollywood (which was linked to the outcry over The Siege), but to the 1981 assassination of Sadat and the Soviet war in Afghanistan. His story is organized in chapters, which spring from the historical background and into thoughts and reflections on the lead-up to 9/11 and the events that have followed. The writer, a thoughtful and passionate Oklahoman, tells some shocking stories—I was unfamiliar with the horrifying tale of the 2002 Mecca girls’ school fire (in which 14 young girls died and more than 50 were injured when they were not allowed to escape or be saved because there were “not properly covered”), or the sad story of the Kabul Zoo. There is pointed discussion of the war in Iraq (“we are following a script that has been written by Osama bin Laden”), and the torture debate (Wright is told, “this plays directly into the enemy playbook”). Particularly interesting are his reflections on his place as an objective journalist; he’s been face to face with the most vile extremists, and listened to their rhetoric, dutifully taking down his notes. But where does the reporter end and the human being begin? “Who am I when I’m talking to Al-Qaeda?” he asks. The structure is loose and conversational—Wright and Gibney jump from one section to the next in more of a topical than chronological order. “Sometimes you can’t tell things literally,” Wright explains. “You have to them in a more impressionistic way.” That notion allows Gibney some freedom in the execution of the film, which uses Wright’s monologue as a framework but also intercuts it with more conventional documentary footage of the writer at work and traveling, conducting interviews and accumulating his story. The assemblage and integration is flawless, vividly complimenting Wright’s story (impressively photographed in an inventive style somewhat reminiscent of Soderbergh’s Gray’s Anatomy) with chilling archival footage and first-person accounts. The film’s only real flaws are with its somewhat abrupt ending and, to some degree, with Wright’s on-stage delivery; it’s a little stilted, particularly in comparison to how off-hand and conversational his interviews and narration are. My Trip to Al-Qaeda is packed with information without overwhelming the viewer—it is intelligent and thoughtful, Wright’s words and Gibney’s images painting a picture that is bleak and troublesome. He does not soft-sell the hopelessness of this fight; Al-Qaeda is, in his words, “an engine that runs on the despair of the Muslim world.” These fundamentalists see this as a holy war in which death is not only not feared, but sought out. How do you defeat this enemy? But Wright will not give in, either. “Al-Qaeda can’t destroy America,” he notes, echoing a key scene in The Siege. “Only we can do that… to ourselves.” My Trip to Al-Qaeda is powerful, thought-provoking stuff. "My Trip to Al-Qaeda" premieres tonight on HBO. Saturday Night at the Movies: "SherryBaby"
New on Blu: "The Player"
On DVD: "That Evening Sun"